Sitting within the well-known Knowsley Business Park of junction 4 of the M57 in Merseyside, Knowsley 800 is a truly multi-modal site being close to motorways, a port and a rail freight terminal. Liverpool John Lennon Airport is also just 30 minutes away. 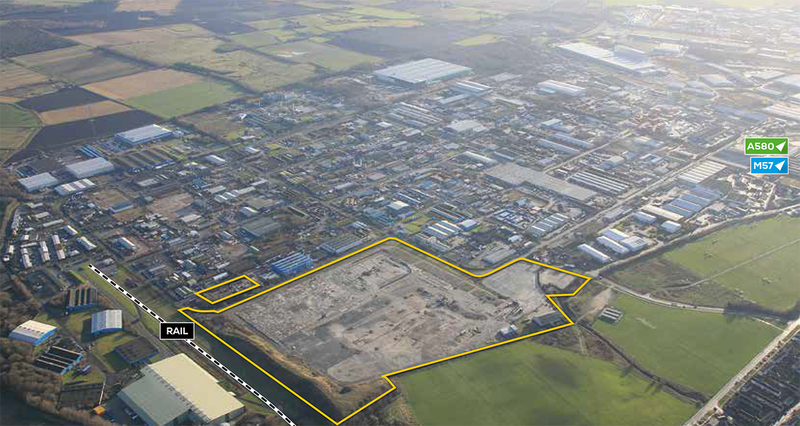 The site sits in a Primary Employment Area and the land is suitable for B1/B2 and B8 uses, with the ability to take a self-contained unit of up to 800,000 sq ft. The site also benefits from a rail freight interchange being situated adjacent and has up to 8 MVA of power available to occupiers. Nearly 1.2 million people live within the peak hour’s journey to work area of Knowsley and 68.5% of them are of working age. 41,700 of these work in the logistics and distribution sector and levels of work-related training are high. Despite this, Knowsley benefits from low labour costs, making the site perfect for a large inbound employer looking for logistics skills and experience. Grant assistance may be available to qualifying companies under the Regional Growth Fund. Knowsley 800 sits 10 miles east of Liverpool and 32 miles west of Manchester.